In our October edition of ‘Salon Design Of The Month’ we chat to Daniel, founder of the unique DKUK salon. 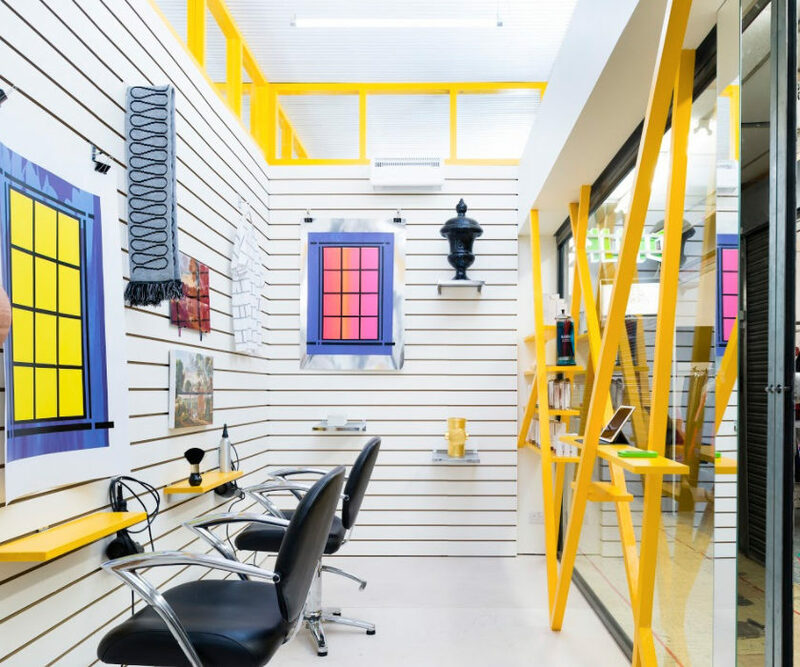 Based in London, the gender-neutral salon is like no other – Instead of offering mirrors, clients look at art work whilst getting their hair tended to. Find out how Daniel blurs the line between art and hairdressing to create an exciting and innovative client experience. Tell us more about how DKUK started? DKUK began when I combined the two areas of my life, art and hairdressing. I trained as a hairdresser with Toni&Guy when I was 17 and worked as a stylist. Then, at 22, I went to Camberwell College of Arts to study painting and worked as an artist for a few years after before combining the two! And hey presto! DKUK – haircuts in front of art, was born. How do DKUK stand out from its competitors, especially in the LDN market? As far as I know DKUK is the first salon of its kind, where clients sit in front of an artwork instead of a mirror. 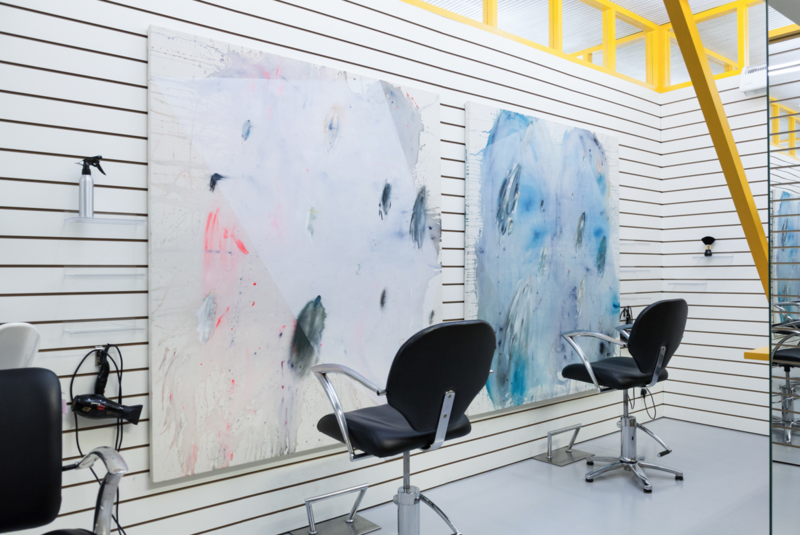 I’m sure we are the only hair salon to receive funding from Arts Council England, which we use to commission artists to make work specifically for the salon environment where, unlike in a gallery, there is a captive audience. Artists love the idea they will have a visitor sat in front of their work for up to 3 hours! 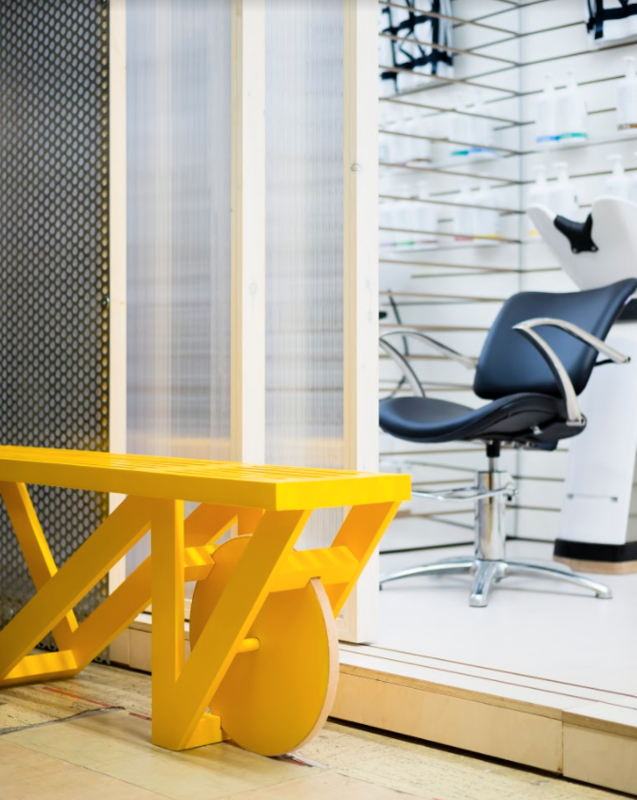 And from a hairdressing perspective it’s always stimulating to have the salon configuration change every 2 months – this prevents us getting stuck in a rut with our work. We worked closely with an inspiring architect called Sam Jacob. He took the pre-existing slatwall design of the unit we moved into and created a design which complemented this traditional shop interior with a contemporary twist. 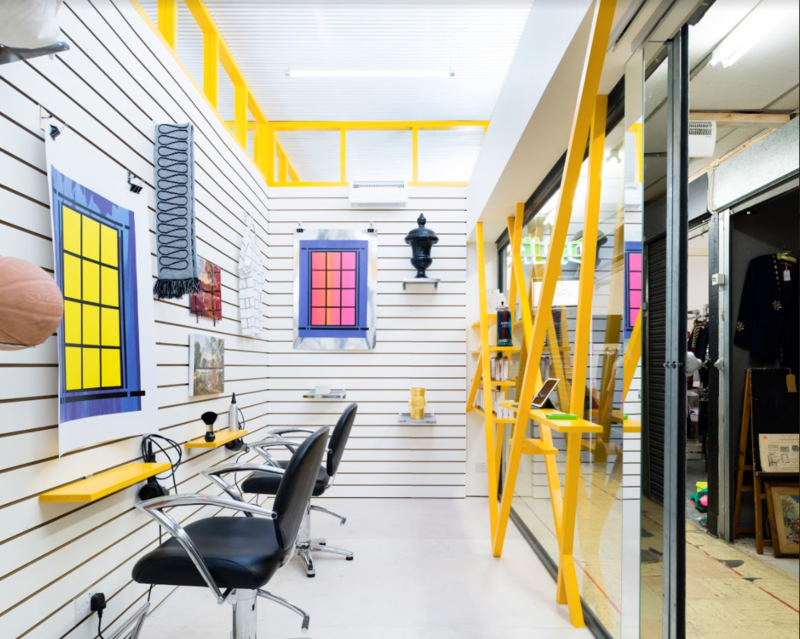 The yellow zig zag structure was purposely quite ‘loud’ to give the salon side of the business a visual representation over the exhibitions. 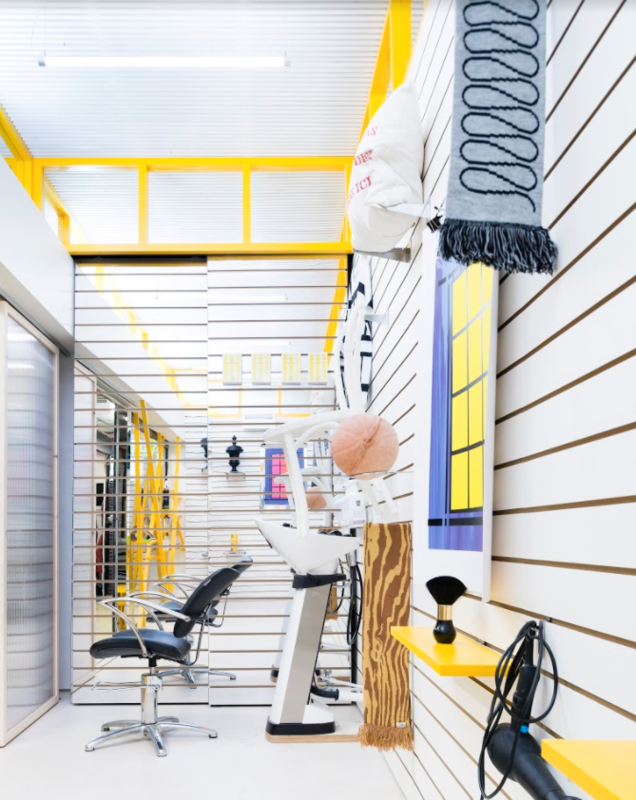 Originally the space was more of a gallery where haircuts happened, but what we are striving for is a 50/50 balance between the art and the hairdressing. As society has become more aware of gender fluidity over the last ten years, we thought it was about time that the pricing system for haircuts reflected this change. So we decided to divide our cuts by length rather than gender. Short is anything that is pulled out from the head i.e. graduated. And long is anything that is combed down and cut. How does DKUK keep up to date with the latest trends within the industry? We are based in one of the hippest parts of London, so we take a lot of inspiration from our immediate environment. And we regularly hold workshops to share our ideas on upcoming trends. We also hire outside educators to come in to demonstrate new techniques. What is DKUK’s biggest achievement to date? We made it through to the London regional finals of the L’Oréal Colour Trophy earlier this year. Break the mould, have a total re-think of what a salon can be! What can we expect from DKUK throughout 2017 and beyond? 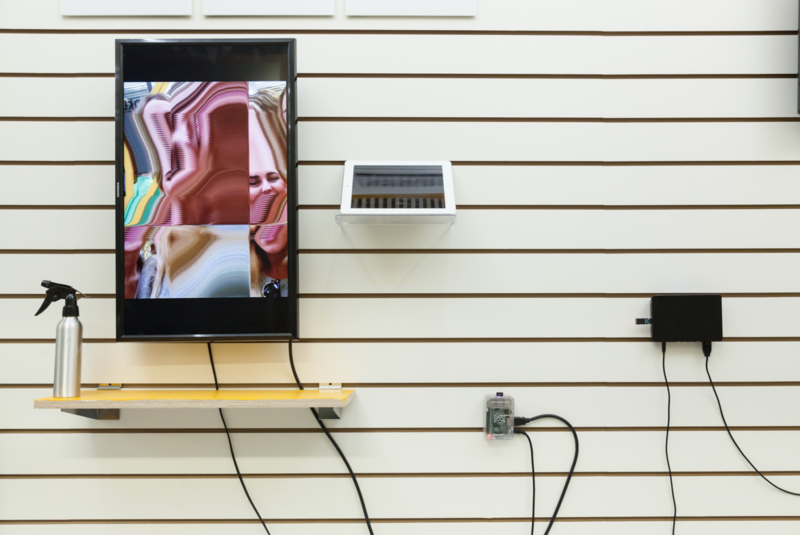 We change our exhibition every two months so there is lots happening in the space in Peckham. We are participating in Sluice Art Fair and Art Licks Weekend in October, then next year we will be doing a pop-up salon In Rotterdam and looking to open our second shop in London so busy busy. Any hairdressers looking for the next big thing should get in touch, as we continue to grow there will be lots of opportunities to be involved.